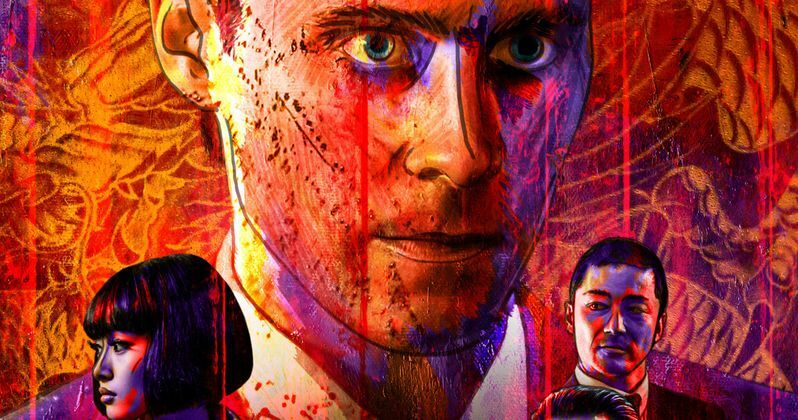 Netflix has released the first trailer and poster for The Outsider, which stars Jared Leto in a much different role than fans are used to seeing him in. This period piece takes the chameleonic actor into an intriguing historical era, as he portrays an American soldier imprisoned in postwar Japan, who enters the dark world of the yakuza, adopting their way of life in repayment for his freedom, after he's released with the help of his Yakuza cellmate. Now free, he sets out to earn their respect and repay his debt while navigating the dangerous criminal underworld. The trailer begins with a woman sporting an intricate full-body tattoo telling Jared Leto's character Nick Lowell about the legend of the koi fish that swims up a waterfall, and becomes a dragon. The footage also features a few Japanese traditions like Kabuki theater and sumo wrestling, while Nick Lowell states that he understands the metaphor behind this legend, revealing that while sometimes in life it's important to fight the current, other times, it's important to, "flow the river." It seems that, at this point in Nick's life, he is going with the flow, as he tries to understand his new life within the Yakuza. The trailer also offers a glimpse at Tadanobu Asano's Kyoshi, who reveals that joining the Yakuza is a choice, one that can't be undone, where one chooses one type of family over the other. There is also a scene where Nick tries to explain the Japanese traditions to Rory Cochrane's Panetti, although Panetti isn't exactly interested because, "we won," meaning the Americans won World War II. When Panetti tells Nick to get out of his office, Nick attacks him with a typewriter, in a rather brutal fashion. The final scenes of the trailer show Nick embracing the violent lifestyle the Yakuza lead, attacking his enemies in various different ways. The cast also includes Kippei Shina, Shiloli Kutsuna and Emile Hirsch, although we don't see him in this trailer. Netflix has also provided a new poster for The Outsider, which debuts on the streaming service March 9, which also debuts alongisde the third and final season of Netflix's Love and the new series Collateral. While it won't debut in theaters, it will arrive the same weekend that Disney's A Wrinkle In Time, STX Entertainment's Gringo, Entertainment Studios' The Hurricane Heist and Aviron's Strangers: Prey at Night arrive at the local art cinemas. Martin Zandvliet directs from a screenplay by Andrew Baldwin, based on an original idea by Art Linson. Martin Zandvliet has previously directed Applause, Funny Man and Land of Mine, while writer Andrew Baldwin is coming off The Take, and he is also writing the upcoming sequel to The Bourne Legacy starring Jeremy Renner. As for Jared Leto, it remains to be seen when and if he will reprise his Joker character in the DCEU, and he is also coming off the critically-acclaimed Blade Runner 2049. Take a look at the new trailer, courtesy of Netflix YouTube, along with the poster for The Outsider below.